An aerial picture of floodwater taken over Balootha, Julia Creek, earlier this week. 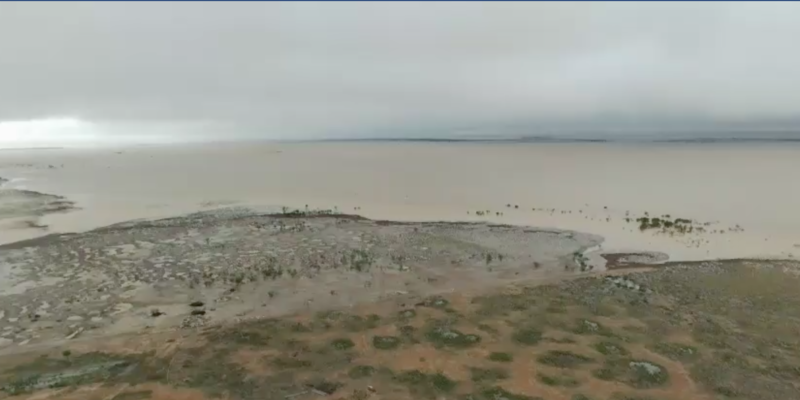 FLYING over inundated paddocks this morning confirmed the devastating reality of this week’s record flood event for young Julia Creek cattle producers Jake and Sally Webster. Their family’s property Balootha on the Flinders River was carrying just under 4000 head, mainly weaners, which were being hand fed due to dry conditions when the record rain event began in late January. “We’ve probably got less than five percent still here,” Jake told Beef Central this morning. What started as desperately-needed drought-relieving rain simply didn’t stop, with 800mm (32 inches) recorded in the past 11 days – more than double their historical annual rainfall average. The relentless rain and flood event has turned into a tragedy of unprecedented proportions in the north. The 1974 floods had stood as the region’s biggest flood in living memory, but general consensus now is that this event is much bigger. Jake said forecasts had pointed to good rain but no one suspected an 11-day deluge and metres of floodwater lay ahead. This morning yielded the first glimpse of blue sky the Websters have seen above Balootha since January 29. “It started raining but it just got worse and worse each day,” he said. He said he had tried to feed the bit of hay he had left to weaners while it was raining, but it just got too cold. “The exposure got to them, they just seemed to get disorientated after a few days,” he said. Where possible he has been pushing mobs of dead cattle together with a tractor to either bury them or burn them before they start to smell. Asked whether he felt estimates that cattle losses across the region could be in the ‘hundreds of thousands’ range, as has been reported, he said he believed that number was likely to be accurate. “Easy. Everyone I have talked to, all their records say this is worse than 74, that is all I have ever heard people talk about being the worst flood.